Every month a plastic wrapped wad of paper, sometimes 300 sheets thick, used to land on my desk. This wad contained the ethics committee paperwork, usually around 20 applications and supporting documents, for me to review. This pile of paper drove me nuts. Not only was there so damn much of it, it was hard to manage. Ethics committee is your classic ‘baking powder’ job; generating an increased workload with no corresponding time compensation. Consequently I read ethics committee paperwork on the train, tram, in cafes, queues and on the couch at home – almost never at my desk. I was always losing sheets, spilling coffee on it or tearing corners as I stuffed the wad in my bag. By the time the meeting rolled around it looked like a truck had driven over it. I enviously watched my colleagues bring iPads (or as Mr Thesiswhisperer so charmingly calls them: ‘fondle slabs’) to ethics meetings, but never actually use them. I was amazed that people could own such a desirable piece of technology and continue to scribble furiously on paper. I would gaze longingly at these lonely iPads, imagining stealing one and transforming it from a fashion statement into a workhorse. Finally, late last year, after complaining long and loudly about the ethics paperwork to anyone who would listen, I was given an iPad of my very own (thanks Denise!). As I pulled my new toy out of its box and admired its shiny shiny-ness I made a promise to myself: I would not be one of those people carrying my electronic friend on top of a pile of paper. I would henceforth try to mend my papery ways and go completely digital. As it turns out, going paperless is not easy. In their book “The myth of the paperless office”, Sellen and Harper talk about the many studies of the paper problem which have been conducted over the last 40 or so years. Sadly, all this research effort doesn’t seem to have curbed our appetite for the white foldy stuff. Despite the explosion of digital media and devices, paper is more deeply entrenched in our working lives than ever, partly because printing is so easy. Paper consumption world wide has supposedly increased 400% in the last 40 years; offices account for some 30 – 40% of this consumption and – here’s the kicker – Sellen and Harper estimate an astounding 80% of documents which are printed are never used again. This paper habit of ours is clearly unsustainable, but it’s not easy to go paperless or we would all be doing it. People don’t use paper because they are too lazy to do something different; they use paper because it’s useful. Since work habits tend to be habitual, going paperless is a bit like giving up smoking. It’s easy to make a short term changes but hard to sustain them. I managed to kick smoking and I’m happy to report that I have managed to drastically reduce my paper use, from around 600 sheets a month to about 50. Here’s the thing: the iPad does not really behave like paper and therefore does not replace it. You could probably still substantially reduce your paper use without one, but you must change the way you work. One of the key steps I had to take was to admit I had a piling problem. Pile mess is my workplace bete noire. Despite efforts to detox my desk last year, it quickly become covered in piles of journal articles again… for good reason. Buttfield et al describe piles as a low effort way to ‘file’ documents which are related to each other while keeping them accessible. The problem with filing journal articles in cabinets and folders, aside from forgetting what you have, is deciding what category something goes in and remembering where you put it when you come back later. Piles work, but documents can easily get lost in them and searching can be messy. I’ve come to the conclusion that complex knowledge work just resists most filing strategies. Having files with large, loose categories can help, but then you might as well pile and save yourself the trouble of moving the paper about. You can’t solve the problems by filing by author either: names are not easy to remember unless they are distinctive and / or famous. Indexing your collection is a great idea – but who has the time? By way of proving I have largely kicked my journal piling habit -I present exhibit A: the photo on the right of my workstation. Actual desk surface can be seen! Solving this problem has involved finding ways to continue piling, but virtually – in my writing and bibliographic software. I faffed about with Endnote, Mendeley and Zotero before trying Papers 2 for the Mac. I don’t love Paper’s to death, but I’m happy enough because it allows me to drag and drop ‘collections’: which are really just virtual piles. Scrivener, a word processing program which I am inordinately fond of, has an embedded, non printing ‘research’ section. This feature enables me to create ‘piles’ of articles within the documents I am writing. Scrivener and Papers reduced my paper piles by about 80%, however I found I was still printing out many articles. I realised that, like other people in our recent #phdchat on note taking, merely highlighting and typing short snatches of text didn’t feel natural – I was itching for something more. I enjoy underlining, drawing and make other marks on articles; I believe it helps me to think better. After some research I found ‘Goodreader’ – an app that allows you to draw on top of PDFs – and a stylus. This seems to scratch the itch – for now. I’m still working on how to get that 50 print outs down to zero, so I’m wondering: What about you? What tools have helped you reduce your dependence on paper? Or do you desire to go paperless, but find it difficult? I hope you will share your experiences and insights in the comments! This entry was posted in Getting things done and tagged ipad, technology, Writing. Bookmark the permalink. Three months into my research I have managed to remain paper free, which was my goal. I also scan things like book pages/chapters straight to PDF and incorporate these into Mendeley. Mendeley also works on my iPad / iPhone (syncs automatically) so when I am out and about I can still check an article anytime. 2. Devonthink Pro (sorry, Mac only) – indexes all PDFs. Allows for full-text searching. I also index all other writing as I go along. Means that I can always find that obscure item! 3. Kindle – Because I utilise historical data I also use Kindle (via iPad) to manage some books – again this allows for full-text searching. 4. Bento – Fieldwork (I am working across archaeology and ecology in my thesis) is recorded via Bento on my iPad – GPS –> maps on the fly, photographs, in-field sketches and text data. This is synced to my laptop with Bento. Data can then be exported toothier databases for detailed analyses. Bento is great for field recording, but reporting options are a bit limited. 5. Google maps – I create private Google maps to plot and share data collected in the field with my supervisors. I’m a “piler-filer”. My desk (pile) is my “filing” system. Just like a filing cabinet where papers go to be forgotton or knocked down to the to-do list, my desk is a place where things sit neglected and sometimes forgotton. Except this way, there is no worry attached to either of these things, as there is when you file stuff “away”. This tricking of the self is incredibly productive. My desk may be an absolute mess, but my mind is free from the clutter (of worrying I’ll forget or remember where I put things). So, when people ask me, “how can you work like this? Don’t you find it stressful to work in such a disorganized environment?”. I point them to my desktop, and show them how much “worse” it could be. I have rules set up in Outlook so that most incoming msesages are automatically sorted by category. This allows me to quickly see client requests and leave less important emails to deal with later. Newsletters go into a special reading folder so they don’t distract me from my priorities. As I go through my emails, if action is required, I create a task in Wunderlist, then move the email into a folder for that client or project, so the only things remaining in my inbox are things that only require a click read and/or response. I use Skim reader and PDF-XChange Viewer (Mac and PC respectively). They’re pdf viewers that allow you to annotate pdfs in a variety of ways, including scribbling with a stylus which I love. I like the idea of a paperless office but in reality, it’s very – very tough. I don’t file papers anymore, I make sure that I do it all electronically. One of the big motivations for doing this is the ease at which I can back up information and access it from different sources using services like Dropbox and Google Drive. As for the pile of papers on my desk, I always make sure I have a regular and brutal recycling fest. Everything goes in the recycle bin so I have to back it up electronically if I want to keep it. If not it goes. For now, everything is much easier to find. Most of the papers on my desk come from other people, and there aren’t really that many. I don’t think I would be able to keep it so pape free if I was getting 300 sheets every month! I would be tempted to try and scan them all into my computer though and carry them round on an iPad. P.S. I don’t actually have an iPad yet but this this going in the “Pro” column. I come from a design background, so I’m used to pushing around paper for not only reading and annotating but also sketching and making! I got a rude shock at my university when I was told we could only hotdesk (and would have to work in the library after hours/in the weekend). So I’ve been trying to go paperless not only for efficiency but also because I can’t haul things around. I do miss not only being able to pile but also put things up on the wall to look at. While I have Mendeley for reading, Endnote for note taking, Pages/Word for writing and Illustrator + a Wacom for sketching and diagrams, I am considering an iPad + stylus for more on-the-fly diagrams (heard some good stories about the Wacom Bamboo one). I have a “paperless peak” in my workflow. When I started with the thesis I liked to print things out because everything was so new and the information was so dense to me that I really needed to go over it multiple times on paper and hand-write notes. At some point I became more comfortable, was doing more targeted reading and was happy to just type up notes so I could copy them across to the thesis. Now I’m at the pointy end of things my brain is too full and I’ve taken to printing more things out again so they’re in my face (and then hopefully in my brain). I’m certainly using less paper than I was at the start, and it’s great to know I can just pick up my computer and (usually) have everything I need to get through a few days work. I’ve also stopped filing so much, instead I make sure I have PDFs of all the articles I want and all my fieldnotes. I guess that just shifts the problem from paper to digital storage. Chronic Piler. Though I virtually pile as well as actually pile. I am getting better but I find it very hard to read PDFs on screen due to various problems with my eyes so most PDFs get printed out, read and then filed. When I am writing a paper I get piles around my chair on the various sections I need to work on. I make sure I link every Endnote reference to a PDF where possible and I organise all PDF’s and Endnote libraries into “sections” depending on the area I am working on. I was a huge paper piler. Now I use effectively the same solution as Inger with a couple of different programs but same genres. Zotero to save PFD’s and act like a personal library catalogue (which I use it for more than as a citation tool). PDF X-Change Viewer to turn practically everything into a PDF and mark it up and comment. Scrivener to sort my library of PDFs and notes into collections of doable bits and notes to write up. Other adjunctware is to occasionally use Gooreader (not a typo for GoodReader). Gooreader scrapes all it can from Google books and turns it into a PDF, so you have an offline copy of the readable bits of Google books which you can attach to Zotero entries for the book. If I have the actual book I also use the Google book in native or Gooreader form as it makes the book slightly more machine searchable. Invaluable for when you have lost the page number for a quote. I use Evernote exclusively for non thesis paper, so everything I want to remember from recipes to receipts goes in an Evernote file with tags so I can find it. Because it syncs to my phone its great for shopping for weird things you have digitally clipped from a webpage, or adding window shopping items by photo. Saves paper clippings. Plastic cards are almost too small to count as a ‘pile’ but I use an e-wallet which syncs with my phone for my plastic cards, magazine subscriptions, identity docs and website passwords. Has the advantage of ‘one password to rule them all’. Still have to carry the actual card at the moment but I’m sure it won’t be long before codes on phones replace cards. My remaining sin is newspaper piles. I can’t bring myself to go digital yet. But its close! Now someone needs to invent an anti pile device for ‘the internet of things’. I like Notability more than Goodreader for the iPad. They both let you write over PDFs with a stylus, but Notability gives you a non-active panel below the stylus where you can rest your hand, without the iPad getting hysterical. Hi thesis whisperer – this is my first post to a blog as I just wanted to acknowledge the great work you’ve done putting this blog together. I find it IMMENSELY useful. I am based in the UK and am a PhD student trying to come to terms with the highs and lows of this labour of love. I hope i’m not chatting on the wrong forum or topic (very new to social media), but wanted to ask a couple of questions regarding this week’s blog. I am using scrivener and Mendeley as my two main knowledge management systems, however i’m not very good at integrating the two for maximum efficiency. Would you recommend using Papers2 over Mendeley? I too have an ipad and find it incredibly useful but am probably not using it to its fullest. Any suggestions or posts you could refer me to would be tremendous. And by the way, did i mention how fabulous this blog is?!!! Google Docs (now Google Drive) – multiple folder filing, and good search function – saves my sanity on a regular basis. And yes – there is an app: Office2, which allows you to access it on iPad or even iPhone (microscope recommended). And Zotero of course – but keeping all the PDFs I want in there would probably cost me some increased server space. I’m slowly trying to go paperless with my iPad. I use NotesPlus for PDF annotation, though I haven’t ruled out trying others too, since I don’t love the file/folder hierarchy. I also just started using Zotero. Zotfile (free add-on) has the capability to send PDFs to tablet for annotation and retrieve them back afterwards, but that doesn’t work well with NotesPlus (another reason I may look into other options) due to the (apparently) inflexible exportation method (save as new file with date & time appended to end of file name). Relatedly, DropBox is great for getting files between computer and iPad. I’d been using Papers but am not sure if I want to pay to upgrade to 2.0 if I’m going to transition to using Zotero. 1. Use your camera phone with the flash turned off to take pictures of slides at presentations. Much easier than scribbling down hasty references before the presenter moves to the next slide! 2. Don’t photocopy pages from books – photograph them instead. Even a phone camera will give pretty good resolution (if it’s a modern phone), and a decent digital camera isn’t expensive. This can become immensely powerful if you then use a text recognition program (OCR) on the images you’ve taken – I use Iris, which converts the image into a PDF file, converting the image of the text to actual text with about 99% accuracy. This is powerful because you can then select quotes easily from the PDF file, and you can use your PC’s search function to search for all occurrences of a word in a folder – and it will find words in the PDF file too. This is ridiculously useful – which of the papers/books I’ve read have references to Abraham ibn Ezra in them? I can either search my PhD folder for “ibn Ezra” – which takes about a minute, and pulls up all Word, text and PDF files containing the phrase and highlights them – or I can search through every book on my bookshelf page by page looking for references 🙂 For this reason, I often scan in printed handouts anyway, and always ask for copies of papers in electronic format if possible. 3. Photograph the notes you’ve taken too and store them electronically – ideally in the cloud, so you can access everything anywhere. 4. Most importantly of all – and this is the stumbling block for a lot of people – learn to read on-screen. It doesn’t feel natural at first, or not as natural as reading a sheaf of papers, which is why people are tempted to print out their papers, e-mails and so on. It does take same getting used to. It’s also easier, I find, if you store everything on the cloud – you can take a sheaf of papers with you on the train, but you can’t take your desktop PC. You probably do take your phone with you, even if you left your laptop behind, and that means you can read those articles on your phone if need be. Nice post. I was checking cnitnouously this weblog and I\’m inspired! Extremely helpful information specifically the last part I handle such information much. I used to be seeking this particular info for a long time. Thanks and good luck. paperless office is a wonderful thing, and I have been able to make use of it at work. However, what I find is that some institutionbs (such as ethics committees) demand paper copies (I had to print up 15 paper copies of my ethics appn) AS WELL AS electronic lodgement. Kinda defeats the purpose of using iPads. Sometimes this insistence on having a paper trail is a government requirement surrounding openness and transparency in the actions of boards such as an ethics committee. Point 4 only works if you don’t have bad eye sight. I had astigmatism when I was younger, and as I have got older reading onscreen has become more difficult as e’s become c’s and a’s and i’s and t’s become l’s depending on what letters surround them. I can read short things on-screen but anything more than a page or 2? I have to print out or I end up with a raging head ache and frustration. I must admit I have the opposite problem as I’ve got older and my eyesight isn’t as good as it used to be. I find I often can’t read fine print on a printed document, but can read it more easily on screen where I can zoom in. In fact, on a recent medieval Latin paleography course, the only way I could read the manuscript was zooming in on screen, the printed version being illegible to me. Paleography is different. That is infinitely easier on screen due to exactly that, being able to zoom in. I may now quit the ethics committee in protest of not getting an iPad! 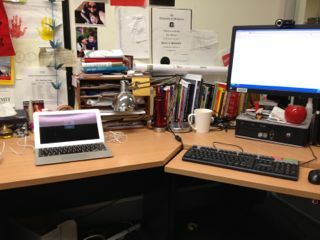 In other ways I am quite paper free, I taught myself to mark papers on screen when assignment submission went digital. I now do almost all my editing on screen to, unless I a really stuck and then I might print it out. I almost never print articles, though still end up with quite a few things on paper as such a large proportion of literature in my area is still not available digitally. Though I recently downloaded an app called CamScanner onto my phone (android) and it photographs pages and turns them into pretty serviceable pdfs. I think it might replace a lot of photocopying for me. Thanks for another great post! I’m definitely a piler, but I noticed that going paperless facilitates the filing aspect of it. Being able to search through your digital piles makes it harder to loose something. Personally I am using Sente (Mac only, http://www.thirdstreetsoftware.com/site/SenteForMac.html) and Scrivener. Sente has an iPad version that syncs all your articles, pdf files and your notes between the Mac and iPad. I does, however, not have any free-writing possibility. But you can save your notes and quotations as a pdf so you can choose to only work with your own notes and not the whole article. I started scanning articles with a ScanSnap (http://www.fujitsu.com/global/services/computing/peripheral/scanners/ss/lineup/) and then adding them to Sente. Keeping all my sources in one place lessens my anxiety of loosing stuff 🙂 David Sparks wrote an iBook “Paperless” with good tips about how to go paperless on a Mac. Agree with Marion above, that Notability on the iPad has a better UI than GoodReader and syncs your notes with Dropbox too. I use Notability a lot for meetings and seminars, as you can record audio as well as write with the keyboard or free drawing. Inspired by the Thesis Whisperer, I have been working on a small series on apps to use in order to finish your PhD. Scrivener and Sente are definitely on my list, as well as Simplenote for ideas and thoughts on the go, and a few more. If you are interested, please visit http://hyperorganised.net/ where I will start publishing the series in the next few months. Thanks, Inger, for always making me see the light at the end of my PhD! Personally I am using Sente (Mac only, http://www.thirdstreetsoftware.com/site/SenteForMac.html) and Scrivener. Sente has an iPad version that syncs all your articles, pdf files and your notes between the Mac and iPad. You can use different colours to highlight and add notes. I does, however, not have any free-drawing possibility. You can save your notes and quotations as a pdf so you can choose to only work with your own notes and not the whole article. 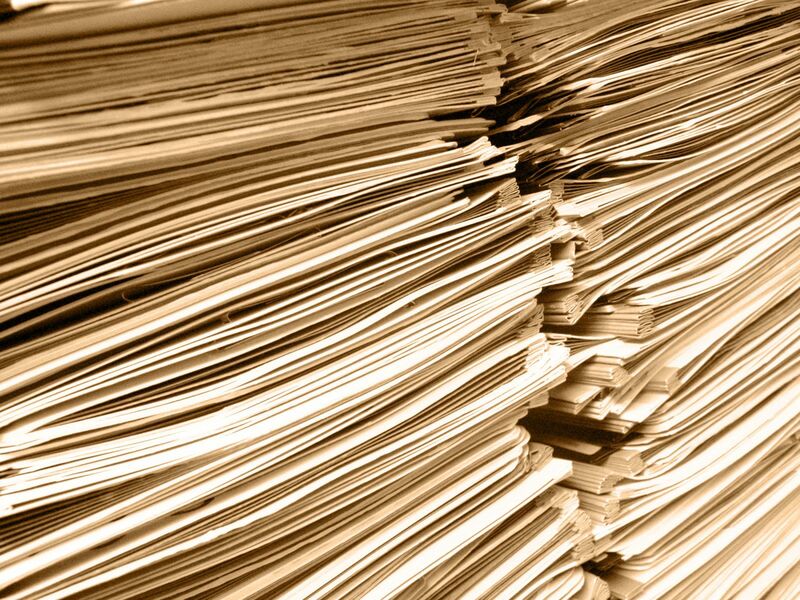 I have always liked the thought of going paperless but in my mind it just isnt practical. I want to, but i cant. I forced myself to go paperless after year 1 Phd, but learning to screen read was a challenge. A good monitor makes a huge difference. Laptop & iPad screens don’t cut it for on screen reading. I’d never go back to printing out articles now, but instead have become a digital piler…terrified of losing my data, I have multiple external hard drives, cloud services (no data here as most have servers in USA)…wish I’d done the data management course that my Uni offers much earlier! a good layout for my weblog. How can I do that? I do not really like the ones offered to you after you sign up, so are there any you can upload for the website? very happy that I stumbled across this in my hunt for something concerning this. I am only 3 weeks into my phd and oddly am finding going paperless one of the biggest challenges for me! I love being able to note, underline, highlight an article – agree with previous comment about it being particularly helpful to have a printed copy in early stage when feeling overwhelmed. That said, I know this can be done on the screen and really have no option but to shift given I work on multiple computers at multiple locations (and the uni has given me only enough filing space for about 50 articles max!). Simplenote (on iOS + desktop computers) was also initially, there but in the course of time got replaced by Evernote. In the beginning, I was very strict about not using any paper; I would bring everything on my iPad, for example for meetings. This would include papers, presentations, plots etc. Later, however, I relaxed this a bit and changed to the attitude that paper is fine – but not for stuff that I need to keep in the long run. So I would never, for example, print and annotate a paper, because this is something I want to keep in the long. Instead I would read and annotate it digitally (PDF + annotations stored in Dropbox, notes and post-processing from reading stored in Evernote). But I would often print plots of data and write scribbles on paper – that I would later throw away or scan and store in Evernote. What is difficult with having only a tablet or only a laptop screen is that it is hard to look at several documents simultaneously. Especially for discussions with others, this was a limitation in the only-iPad approach. On the other hand, it is a blessing to not rely on a single document in physical form; this is extremely flexible when going for meetings and conferences. And also makes it a lot easier to clean up the office when changing jobs.